Ridinger, Johann Elias (Ulm 1698 – Augsburg 1767). Pine Marten. A young one looking down from a branch to its mother bringing a bird. Etching + engraving. (1740.) Inscribed: J. E. R. fec. / N. 86., title in German as before. 7¼ × 5¾ in (18.5 × 14.6 cm). of 1911, Hoberg-Jansen 144 with illustration. (Christian von Holst, Franz Marc – Pferde, 2003, pp. 166 ff. within [‘… the Hoofbeats of my Horses’]). For already his painting “Playing Weasels” from 1911, preceded 1909/10 by the lithograph of the same name, betrays the knowledge of several Ridinger coppers from entirely different sets. Marc shows two weasels, of which the one in the tree, bowed over a bough, looks down upon the one sitting in raised attitude on the ground. The trees besides of an eccentricity which he uses in this ostensible density in the painted œuvre only in the two “Acts below Trees”, H.-J. 143, of the same year. For the thematic initial spark Ridinger’s “The Weasels”, Th. 479, as sheet 89 of the set here stands. Here, too, two of them playing, yet both on the ground and in an utterly different context. The latter Marc split up. (additionally available here the companion piece with the two beech martens Th. 475 plus the original printing plates to both). The young one of which hangs across a bough of equally low height as with Marc and looks down at the mother standing on the hind paws against the trunk luring with a captured bird. “Playing Squirrels” as sheet 88 (Th. 478) shows the same situation, only with the difference of a further one in the tree, too, but keeping a little aloof and not involved in the play. 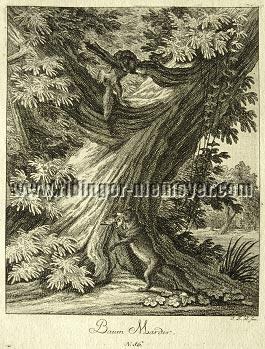 Yet the bizarre tree – and as such Sälzle characterizes it expressly in the edition of the preparatory drawings for the following suite – as rather rarer for Ridinger, too, he took over from sheet 19 of the concurrent suite of the Representation of the Fair Game, the “Trace of a Marten / Trace of the Weasel” (Th. 181), with the same attitude of the marten in the tree and the, however, neutrally shown weasel on the ground. which in this plurality has been missed till now .